AFA Graduation for 2019, 2020 and 2022 ALREADY BOOKED! Please note we only book full weeks for holidays including Thanksgiving. Beautiful custom home in the foothills of Colorado Springs conveniently located close to shopping but located on a quiet Cul-de-sac. Well appointed gourmet kitchen with granite countertops, stainless steel appliances, gas cook top, double ovens and city and natural views. Wet bar, wood burning fireplace and theater room in lower level. Views out every window. Vaulted ceilings and gas fireplace in the main living room. Deck and fenced yard with great city views. View the Colorado wildlife from the window of your home! Relax in the private hot tub which can be accessed from the Master and main living space. Grill on the spacious deck. Soak in the oversized 2 person Jacuzzi tub in the Master or revitalize in the large two person shower. Explore the 1/2 acre lot or hit the nearby hiking trails. Close to the Broadmoor (20 min),Pikes Peak, skiing or Denver (45 min). 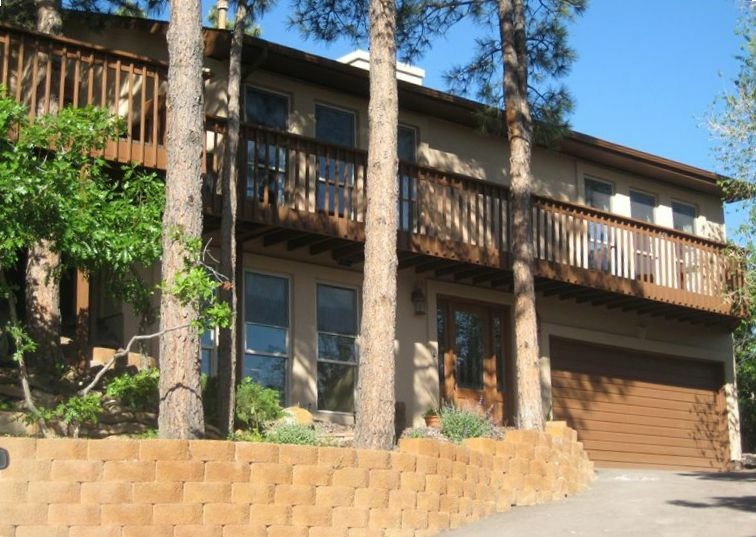 Enjoy all Colorado Springs has to offer plus your own personal retreat once you get home! This home offers you extreme privacy while still being close to everything. Cancellation Policy: 100% refund if cancellation is made 60 days or more prior to reservation date. Cancel 30-60 days prior to reservation will result in forfeit of deposit. Less than 30 days, no refund unless we re-book those days. All cancellations are subject to a $100.00 processing fee. Great property for larger groups who want to be together but still have space. Or for smaller groups who want to spread out! Enjoy the wildlife up close as you enjoy time on our deck with views of the mountains as well as the city lights. Or jump in the new hot tub surrounded by the beauty of the Colorado foothills. We had a large family group for Thanksgiving. Kitchen is spacious, accommodates multiple cooks & double oven was a huge bonus in our holiday week of cooking. Kitchen is well stocked for a rental. We drove so we did bring some of our own special cooking utensils/wares. Dining room table large enough for all of us to eat together. Living room with fireplace was also large enough for many to lounge, read or relax. Hot tub was clean, hot & has great view of valley. Sam was always responsive to our inquires & she left us treats & flowers to kick off our holiday festivities. Great location & quiet neighborhood, 1 exit south from USAFA south gate & close to Santa Fe trailhead (we walked this trail north daily). Lots of deer in this neighborhood too!! Great house and very clean! Owner was very responsive and the house was excellent. We would definitely stay here again. George and Susan, thanks for the feedback. I'm sorry the TV's weren't up to your expectations, they all work just fine as far as I can tell. I've not had complaints but I will definitely look into upgrading. Hope you enjoyed all that Colorado, and my home, has to offer. Especially my home nestled in the foothills with wildlife galore. In the past guests have commented that it was the out of doors and having deer and other wildlife just come right up on the deck while they were outside that really made their trip special. Really appreciate the feedback and am glad you enjoyed your stay. We had plenty of room for 3 generations of family. House was clean and well stocked for our family entertainment. Grandkids loved seeing deer each morning and at dusk. They spent a lot of time in the spa too. Close to everything we wanted to do and great views. Well worth the stay and cool reprieve from Texas heat! Winter base rate is $200/night summer base rate is $400.00 per night Holiday's I will request 5 night's minimum.